Charming family home / sea view and Sept-Iles. "THE HOUSE OF EMMA" is ideal for 4 to 6 people. It is located in the heart of PERROS GUIREC close to the beach of Trestraou (you can do everything on foot: your shopping, the beach, restaurants ...). you can call me at: +33 (0) 6 85 13 05 74. -Beautiful sea view 100 m from the beach of Trestraou. In a quiet area in the immediate vicinity of the city center and beaches. You can park your car in front of the house (free parking) There are always places available. 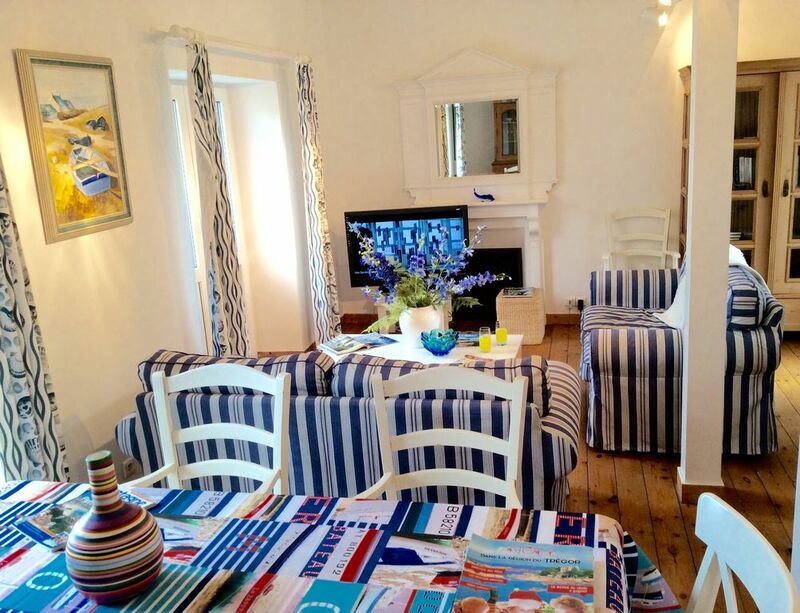 Very beautifully decorated in the style of the seaside, this beautiful villa offers all the necessary comfort for a few weeks of vacation and discovery with family or friends. - The table of the dining room can accommodate 6 people. - On the ground floor a first room with a bed 2 pers. (140cm / 190cm bed). - On the floor a second room with a bed for 2 people (bed of 140 by 190). - Upstairs a third bedroom with 3 single beds (size 90cm / 190 cm). - A bathroom on the ground floor with shower wc ..
- A bathroom with toilet on the floor. House of La Presse, Bookshop .. LEISURE and DISCOVERY in the immediate vicinity. Beach Trestrignel 10 min walk. Nautical center. Surf School at 300m. Excursion to the Seven Islands at 300m. Walk on the Customs Trail. Village and Beach of Ploumanach. Tourism. ( 3 stars) . Official quality guarantee. The house has a stunning view which is accompanied by the gentle call of seagulls. Inside it is well equipped, spacious, well maintained and very light. It is situated a couple of minutes from the town centre where there are two "Tesco Express" type shops with longer opening hours. The hosts are very welcoming and the organisation was seamless. Parking is easy and the property is simple to find. A nice balance of convenience and beauty. What more could one ask? Ten out of ten from us. We very much enjoyed our stay. Idéal pour un séjour en famille ou entre amis. Sehr schöne und komplette Ausstattung, zentrale Lage und ein sehr freundlicher und unkomplizierter Gastgeber. Maison joliment décorée et fonctionnelle. Nous n'avons manqué de rien et l'emplacement est idéal, proche de la mer et des commerces. Endroit très calme. Plage et centre ville à deux pas. Parking très proche. Maison très agréable et propre. Tous ce dont on a besoin en cuisine est disponible. Très agréable séjour dans la charmante maison d'Emma. Située à proximité du centre ville de Perros et des commerces, mais suffisamment en retrait pour être au calme. Superbes points de vue au bout de la rue et vue sur la mer dès le premier étage. La maison répartie sur trois niveaux permet de disposer d'espaces calmes (2 chambres au dernier étage, cuisine au rez-de-chaussée). Accueil chaleureux et sympathique du propriétaire. The beach of Perros-Guirec is 100 meters from the villa. The sea and the archipelago of seven islands is an invitation to relax. Trestraou Beach and entertainment (surfing, sailing, tennis, Mickey club, mini-golf, restaurants, cinema) is 5 minutes walk.